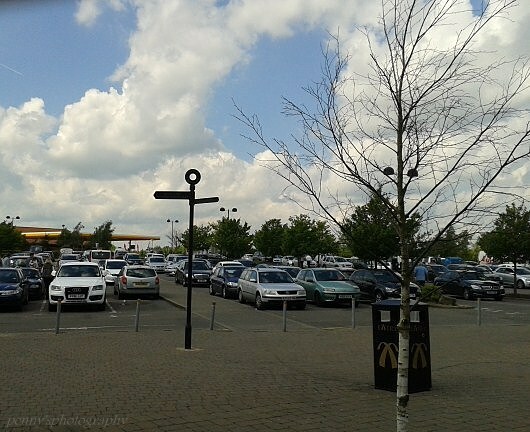 Lunchtime stop at Cambridge Services on the A14 today – halfway home on my way from the West Midlands to Norfolk. I’ve been a frequent visitor to Cambridge Services on the A14 over the past 10 years or so, particularly in the months since Christmas when I’ve been there at least once a week. So much so that when I called in at lunchtime today as I made yet another journey across the country, the young woman in the coffee shop recognised me and offered me a loyalty card! I have been ‘on the move’ yet again. The 420 mile round trip has become a regular part of my life as I travel from the flatlands of Norfolk to the hills of the West Midlands to provide childcare for my 10 year old granddaughter. Today was one of the better journeys: good weather, dry roads, light traffic – if you ignore the convoys of lorries that are an inevitable hazard of driving in the UK, A491 – M5 – M42 – M6 – A14 – A11 – and then through the city and home. My life is ‘on the move’ at the moment and has been for the past six months. I’m between homes – renting in Norfolk, trying to sell a property in Pembrokeshire and waiting to buy in Stourbridge. The decision about where to settle in my retirement has been open to debate and discussion for 19 months now, since I retired in fact! Having been indecisive for so long events are now overtaking me and the options are slowly reducing – it may be that I have to stall the move to the Midlands and sit it out in Pembrokeshire for a while – not so bad during the summer but not where I want to be in the winter and, of course, those trips to the Midlands show no sign of abating, I’ll just be travelling from a different direction! I am used to being in control, to making decisions quickly, pre-empting and reacting to ever changing circumstances so I am not at all comfortable in my current position where I have to wait for forces beyond my control to allow me to move forward. Sitting at the services this lunchtime it struck me that the life of the world is constantly moving. The clouds scud or drift across the sky, leaves sway and shiver in the breezes, seeds burst and grow into plants, even while we sleep our hearts beat to keep us alive as our bodies rest. The world turns and we scurry across it, our daily movements marking the tracks of our lives. When, I wonder, does a movement become a journey? I’ve been pondering your question. I think a movement is something that’s good enough in itself. A journey, however, suggests a deeper level to it, whether that’s a specific endpoint or it’s done with the intent of discovery. Both can be beautiful and liberating, but both can also be frustrating and annoying. Both are necessary though, as the world literally revolves on movement. Nothing feels worse than stagnation. Certainly a journey suggests a series of movements between a departure and arrival point and perhaps implies an element of planning, although I’m wondering if those points need to be fixed or predetermined? A movement often happens in a spontaneous manner, as a mechanical action or as a means to serve a need ….. sometimes subconsciously. Are journeys only human or animal related? I agree about the stagnation – especially in the mind!